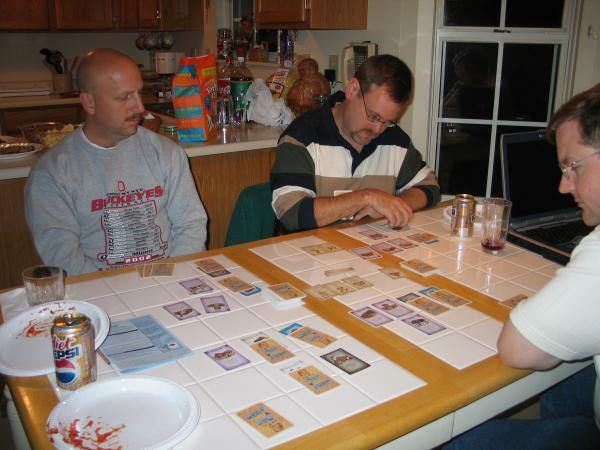 After much Thanksgiving Day overeating, we sat down for a special edition of Family Game Night. I decided to try out Piratenbucht on the kids and Lisa. At 10, Sophie matches the minimum age listed on the box. At 8, I thought Noah might have a few problems here and there but he kept up pretty darn well. In the end, Sophie won, if you can believe it. I’ve never seen anyone throw dice like that. I could not protect my ship in any way shape or form against her onslaughts. When I wasn’t battling Sophie, I kept finding myself battling with Lisa. Noah and Sophie kept racking up tons of cash. We had a new player tonight, Darren Thompson, a co-worker of my wife at the School For Young Children. He seemed to be willing to put up with our quipping and heckling about his silly plays in the game. However, he just didn’t seem to understand the basic game rule that if you can’t advance your own position, then you attack Ken’s position. 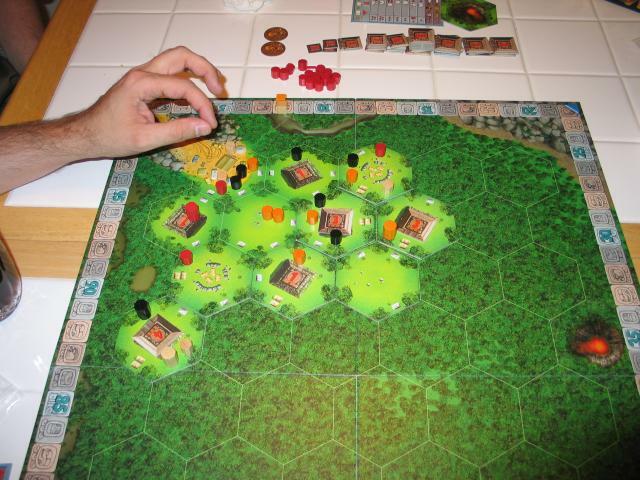 Unfortunately, due to Darren’s lack of zeal in this area, Ken and Rich tied for second in El Grande. Due to the rules of El Grande, a tie means that nobody gets the benefits awarded to the tied position and everybody moves down one. I held the 3rd position solidly with Keith and Darren in 4th and 5th places. We only played the short form of El Grande. Although Keith and I tried to make the short form feel like the long form by maximizing turn angst and even with some quality OCD-like behavior from our esteemed green cube arranger using the code named Ken, our game did end pretty quickly and we were also able to get in 3 rounds of 6-Nimmt.In English, 6-Nimmt translates to “I am screwed because Ken creates huge gaps between numbers”. We hope to have Darren back again but from the pictures you can see that he’s aspiring to “be like” [sleepy] Rich. If he keeps that behavior up we’ll have to crank the ridicule level up a few notches. Keith blessed us again by hosting so thank you very much Keith (and Rhonda). 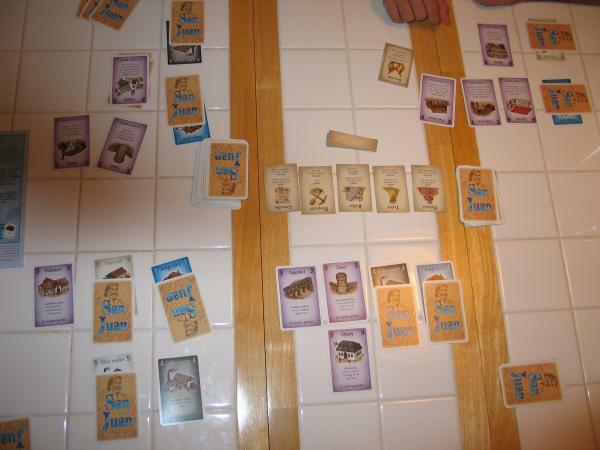 This month’s game was the card game version of Puerto Rico called San Juan. If you’ve ever played Puerto Rico (we all had), the rules to San Juan will come pretty naturally. After a quick run through the rules, we commenced and played leisurely for about 2 hours until I was declared the winner by a small margin over Ken. Rich was glad to not be last to Keith’s dismal performance. The “board” about a 1/3 into the game. Clockwise from the top left: Keith, Ken, Rich, and my hand. Rich wakes up to take his turn. Strangely enough though…his eyes are still closed. He’s using his psychic powers to simply “will” the right cards into his hand. Yes…I do actually play the game so that’s me taking poor advice from Ken concerning my next play. Looks like Keith is finishing off some more of something. Four new card games arrived today! I played Fluxx with the kids and Noah won after making use of a crafty Action card that allowed him to mine the discard pile for a “swap a Keeper” Action card. This Action let him swap one of his Keepers for one of mine that allowed him to meet the Goal. 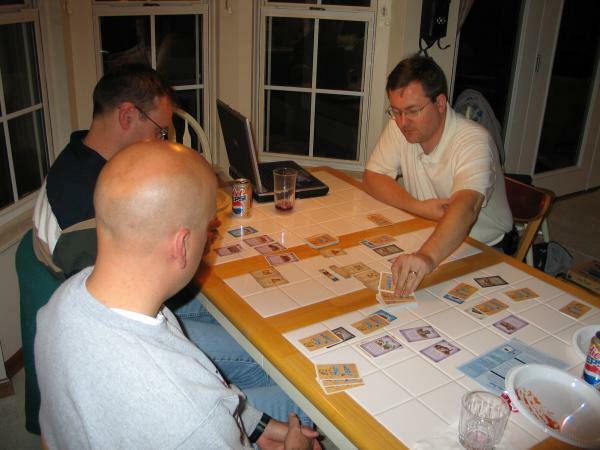 Fluxx – A card game where the cards themselves determine the current rules of the game. By playing cards, you change numerous aspects of the game: how to draw cards, how to play cards, and even how to win. Set – Each card contains 1-3 matching objects, in one of three colors, shapes, and shadings. Nine cards are laid out, and the first person to spot a set of three collects those cards. The cards are replaced from the deck and play continues.A set consists of three cards which are either all alike or all different in each attribute: for instance, if all three cards have the same number of objects, but different shapes, shadings, and colors, then they’re a set. Bang! – The outlaws hunt the Sheriff. The Sheriff hunts the Outlaws. The Renegade plots secretely, ready to take one side or the other. Bullets fly. Who among the gunmen is a Deputy, ready to sacrifice himself for the Sheriff? And who is a merciless Outlaw, willing to kill him? If you want to find out, just draw (your cards)! San Juan – A card game based on Puerto Rico. The pack of 110 cards consists of production buildings (indigo, sugar, tobacco, coffee, and silver) and “violet” buildings that grant special powers or extra victory points. Cards from the hand can be either built or used as money to build something else. Cards from the deck are used to represent goods produced by the production buildings, in which case they are left face-down. A seven-card hand limit is enforced once per round.In each round or governorship, each player in turn selects from one of the available roles, triggering an event that usually affects all players, such as producing goods or building. The person who picks the role gets a privilege, such as producing more goods or building more cheaply. Though similar in concept to Puerto Rico, the game has many different mechanics. In particular, there are no colonists and no shipping of goods; goods production and trading are normally limited to one card per phase; and trades cannot be blocked. 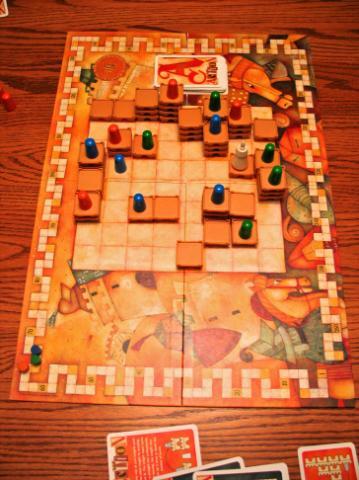 Victory points are gained exclusively by building, and the game ends as soon as one player has put up 12 buildings. 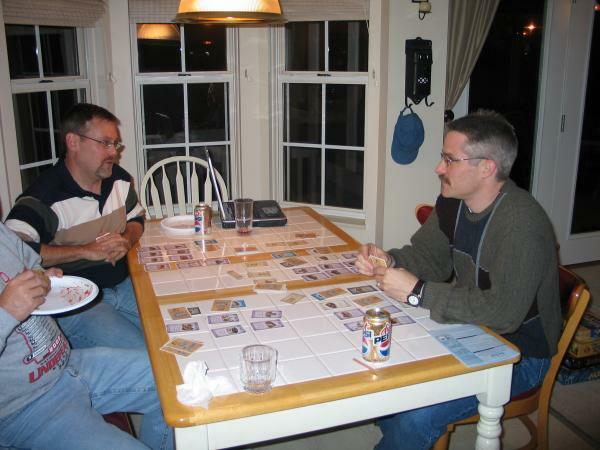 Rich was kind enough to host our “analog” game night. We got to see their new dog for the first time too! Paul Knapke brought Fluxx. I had never played but have wanted to for some time now. We played a couple games and I was pleasantly surprised. I think I’ll put in an order for this one. We were also able to get in a couple rounds of Torres before Paul had to leave. Note Paul’s sneaky way of blocking Rich and I out of the King’s bonus on the right center of the board. 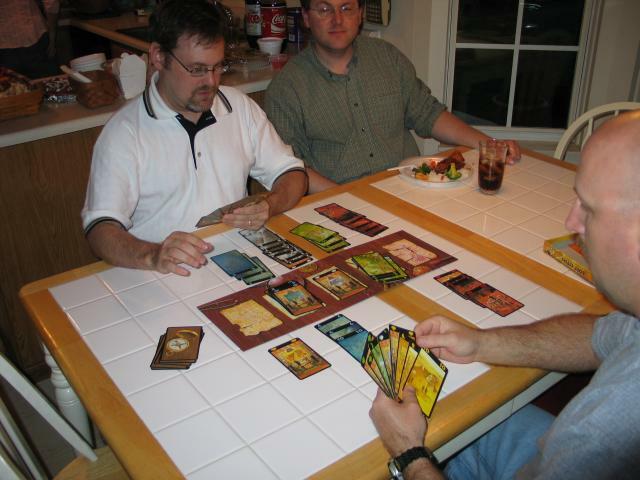 Once a month I get together with a few close friends to play”designer” board games. A “designer” board game usually cannotbe found in your average Target, Kohls, or Walmart. Instead thesegames generally come from Europe and historically from German gamedesigners. Unlike non-designer/”American” games, designer games are usually much less luck-oriented, usually involve much more strategy, and usually more “mind numbing”/”brain burning” turn angst. Most games lastfrom 1 to 2 hours. We chose to play Tikalthis evening. 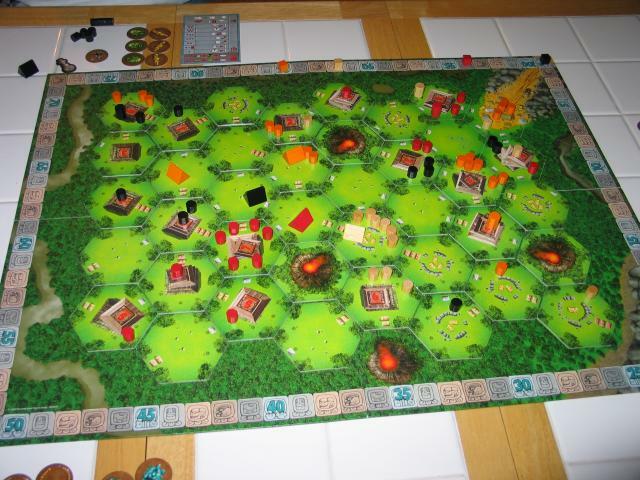 Ken (black) won with 101 points. We pretty much let him win sincehe gets kinda nasty if he doesn’t. Rich (red) came in second. You’ll noticeRich as the guy whose eyes are half closed. He wasn’t asleep…really. He justlooks that way more often than not. Keith (natural) was kind enough to host the game at his house. I (orange) came in last because I was nice enough to sacrificemy position for the host. Otherwise I would have easily beat them all…handsdown. Ken Huffman and Rich “The Sandman” Ball on one side of the table. Keith Rose is on the other side. Ken and Keith are playing Lost Cities until the real game begins. An action shot of Ken trying to figure out how to undo yet another move he’s unsure about. This is about as close as you get to visualizing the sheer thrill of turn angst…better known as the “hurry up Ken” maneuver. The final state of the gameboard showing my valiant efforts to ensure Keith didn’t come in last.